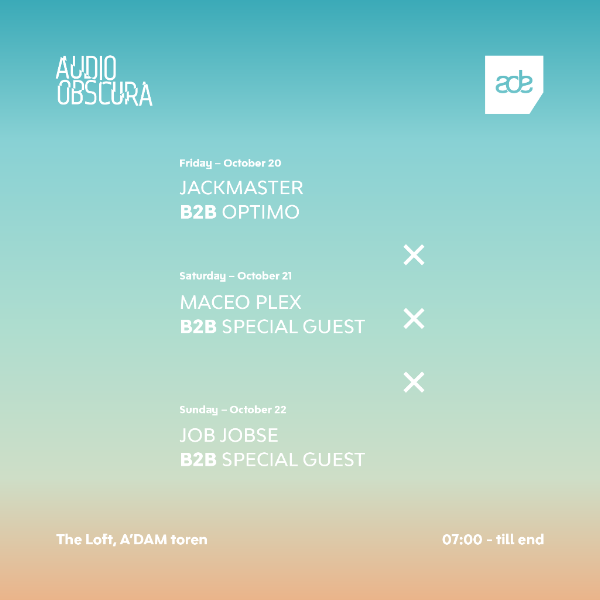 Amsterdam, September 28 | Started as a one-off during ADE 2016, Audio Obscura now announce not one, but three unmissable afterhours sessions during Amsterdam Dance Event in The Loft. This stunning venue is located on the 16th floor of the A’DAM Tower in Amsterdam Noord with sweeping panoramic views over the area. Running Friday, Saturday and Sunday morning from 7 AM, the parties seek to replicate the vibe of the afterhours at the venue in 2016 with Maceo Plex and Solar and back in May with Job Jobse, Dixon and Oceanic . The huge success has spurred the Audio Obscura team to extend the concept to three days, with huge guests on the bill all playing special back-to-back sets. Friday morning (October 20) will be a Glasgow takeover, with Jackmaster and Optimo continuing their close friendship and playing eclectic delights together. Saturday (October 21) sees the return of Maceo Plex, bringing slick house and tech flavours, while Sunday (October 22) will see local hero Job Jobse hold court. The special guests that will be playing alongside Maceo Plex and Job Jobse will soon be revealed so watch this space. If that isn’t enough to make you want to skip work / sleep / breakfast, we’ll be surprised! Advance ticket sales begin on October 5, so set those alarms.